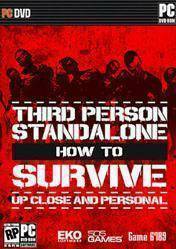 How to Survive Third Person Standalone is a digital version activated from Steam,adding the cd key or digital code that you´ll receive by email after buying How to Survive Third Person Standalone. This new version of the game of zombies, developed almost entirely thanks to suggestions from the community, offering a superior experience to its predecessor How to Survive, but with a third-person view, much more immersive. We must survive in a chaotic world infested with zombies, with only the help of our ingenuity to create all kinds of weapons and tools to help us fight this growing and uncontrolled threat. Collecting food, water and shelter will our priorities for this new version of How to Survive. This new version includes: All the content of the original game, plus 4 new islands, a story mode, eight challenges, durability on items and all the DLC and expansion packs from the original title. Please carefully read the information on the download methods, shipping times of the keys and payment methods in each of the stores. There are no comments yet about How to Survive Third Person Standalone . You can be the first one! HOW TO SURVIVE: THIRD PERSON STANDALONE - Gameplay Walkthrough - Part 1 - Intro!